A few years back I wrote a posting about the mid-19th century taverns of Michigan, which included traveling experiences of the time, food served at a tavern, overnight stays, and, in general, giving an overall understanding of this much over-looked segment of American history. Now I'd like to take a step back even further in time and visit the taverns on the east coast from the last half of the 18th century, during the turmoil of our Nation's founding. Taverns were the pulse of 18th century urban life, and their importance to the local community cannot be overstated. But if someone says the word "tavern" in our modern day, the immediate reaction is a "bar" - a place in which the sole purpose is to have a drink, maybe eat a burger, possibly play some pool, and generally hang out with friends and/or acquaintances. In days of old the people who frequented taverns did much the same, as William Black wrote (18th century - exact date unknown): "Went to the Tunn Tavern, where in company with the Governor and four or five more we din'd: after Dinner & a few Glasses of what was very Good wine, I went with some of our Company to the Billiards table, where we spent the afternoon..."
The main difference from today to "back then" is that colonial taverns were also usually a stage coach stop for travelers; a patron could spend the night and eat breakfast, dinner, and supper, should the need arise. Taverns were also the main source of information for the locals. Alice Morse Earle wrote in her 1901 book Stage Coach and Tavern Days: "Though today somewhat shadowed by a formless reputation of being frequently applied to hostelries of vulgar resort and coarse fare & ways, the word "tavern" is neverless a good one..."
"Aye, would ye like to come into the tavern with me?" 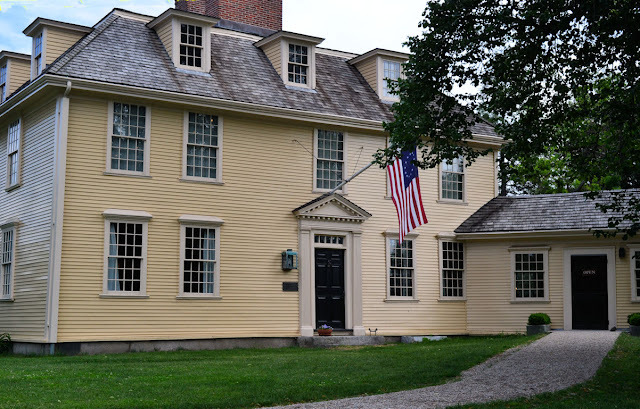 These "publick houses" (or 'ordinaries,' as they were also known) have played an important part in social, political, and even military life, though we see them taking more of a back seat in their role in our Nation's history. It is assumed average middling (middle class) people traveled more than likely by foot to get from home to village, though to go any great distance taking a stage was almost necessary. And these stages nearly always stopped at a tavern; in rural areas where no taverns were near, strangers were welcomed into the homes of the locals. One of the more frustrating conditions for travelers of the stage was that no matter how long the journey took, nor where they were going, the coach always started before daybreak. The traveler had to rise in the dark, dress in the dark "most feebly illuminated," eat a hurriedly prepared breakfast in the same type of light, and begin in the blackness of night, with only the stars and maybe the moon as the guiding lights. 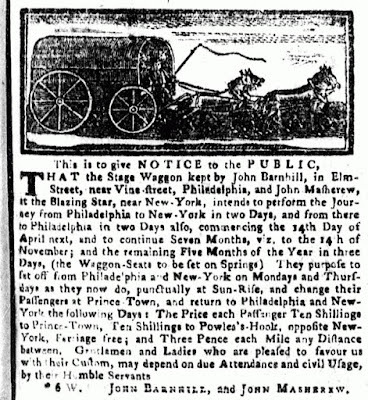 As Josiah Quincy wrote: "At three o'clock this morning the light of a candle under the door and a rousing knock told me that it was time to depart, and shortly after I left Philadelphia by a vast illimitable wagon, capable of holding some sixteen passengers with decent comfort to themselves, and actually encumbered with some dozen more. After riding till eight o'clock we reached the breakfast house, where we partook of a good meal." The stages were often crowded and the seats were available on a first-come first served basis. Aristocrat Sir Augustus John Foster described the men he shared a coach ride with as "very disagreeable companions (and were) not fit to associate with Gentlemen." And travel was slow; it took nine hours to get from Boston to Providence. Israel Hatch most respectfully informs the publick that his line of Stages will run every day in the week, excepting Sundays. His Coach leaves Boston at 5 o'clock, and arrives at Providence by 2 P.M. The Stages from Providence start at the same early hour, and arrive at Boston by 2 o'clock. The notice continues on to explain of switching the horses halfway through the trip and lists the taverns that the passengers may choose to stop at, including the Grand Turk and the Coach & Horse. The price of one ticket to travel between these two cities? "One dollar, which is one half the customary price, and 3s cheaper than any other stage---"
And twenty pounds of baggage was allowed. Stagecoach travel, as quaint as we see it from our modern time, was hardly quaint to the traveler. The condition of the roads at the period of the beginnings of the formation of our country were not of a high order. Little money and labor was put toward them. Riding in a coach has been described as being "like a ship rocking or beating against a heavy sea; straining all her timbers with a low moaning sound as she drives over the contending waves," and the experience could be hazardous and fatiguing with weather always an uncertainty; bad conditions could delay the best laid plans of any traveler. William Palfrey wrote in 1773 of "a most tedious Journey occasion'd by heavy Rains and high Winds which prevented my crossing the ferries." In the winter the drifting snow made it nearly impossible for a coach to get through at all, while in the springtime the mud was anywhere from twelve to eighteen inches deep, with the lowland mud even deeper. The constant balancing by passengers leaning to one side or another to prevent the stage from overturning in the frequent deep ruts was a necessity. The state of the roads and the fear for those traveling is shown in a letter written from a mother to her eighteen year old daughter: "Your papa would not trust your life in the stage. It is a very unsafe and improper conveyance for young ladies. Many have been the accidents, many the cripples made by accidents in those vehicles. As soon as your papa can go, you may be sure he will go or send for you." In May of 1776, a stage coach traveler remembered, "I went to Pomfret, thirty six miles in a chaise; the road was so stony and rough, that I could not ride out of a slow walk, but very little of the way; I was near two days in going, such was the general state of our roads..."
Then there was traveling in the hot and dry days of July. Whether one was inside or outside the coach, it was nearly impossible to escape the dust of unwatered roads or the "fervor of the July sun." Another story explains of how it took seventeen hours to travel the sixty six miles from Fredricksburg to Richmond (Virginia), and the coach stopped at ten taverns on the way. It rained and there were complaints of wet feet, clothes becoming plastered with mud from the wheel, the travel trunks taking in water, the horses "draggled and chafted by the traces," and the driver's neckcloth becoming saturated. Yet, the driver wrote, "the journey was performed pleasantly." Hmmm...perhaps because they may have taken in a warm drink at each of the ten tavern stops? As rough it was to travel by coach, I would still like to experience what it would be like, maybe for an hour or so, to help give an understanding of the reality of our ancestor's lives. Another account that took place one December evening (from the book, The Colonial Tavern by Edward Field: The winter winds and heavy snow discouraged travel, and one unfortunate coach met a drift and overturned. The last 'ordinary' the coach had passed was five miles behind them, and the next was five miles ahead, and the storm's intensity was increasing. The six passengers stood angrily staring at the overturned coach, knowing that to remain would mean to freeze and that the nearest shelter was five miles in either direction. At the tavern beyond, the wind whistles down the chimney, now and then blowing the smoke out into the great room where the men folks of the house are assembled in the growing darkness. They knew there would be no coach that night. "It's drifting bad and he'd never get through with that pair of wheelers." Shortly after they heard someone on horseback shouting and looked to see the figure waving his hands like mad. "Coach is on its side and six of 'em up there about five miles freezing in the woods. You'll have to put a fresh pair in the pung (a box-styled sleigh) and go up and get 'em!" Through the biting wind and the whirling flakes the stable hands and men, well bundled, cracked the whip and made their way as fast as the two powerful grays could take them. The mistress of the tavern, in anticipation of the hungry group, busily prepared food and drink. Upon arrival (at the tavern) of the pung with the six nearly frozen passengers and the team of the overturned coach, hot toddies were served up and a place near the roaring hot fire set aside. What a cheerful place it was after these hours of exposure to a bitter winter storm, and how well the hotcakes, coffee, and bacon tasted, and how right to the spot does the hot toddy find its way, and how well did the tavern keeper and his good wife know how to soften the hearts of such travellers when they came to the ordinary with empty stomachs, fussing and swearing over their misfortune. The only landmarks other than the natural ones were taverns, and travelers measured their journeys in the miles from one publick house to another. Early almanacs contain a few old stage routes with the various tavern stops. In the New England Almanack or Lady's and Gentlemen's Diary for the year 1765, the "Road to Hartford, through Killingly, Pomfret, &c., From Providence Court House, on the South Road, over the Great Bridge," wound snake-like over hill and dale, through thick woods and meadow land to Jonathan Olney's tavern in Johnston, two miles, then to Joseph Fenner's tavern, one mile farther. The rumble and rattle of the lumbering vehicle over rough country roads warned the villagers that news and information was nigh. The tired "road-stained passengers were let out of the vat-shaped box, stretched their limbs, and with a satisfied look that they had escaped disaster, entered the tavern." A person did not have to be traveling a great distance - according to our modern definition of what a great distance may be - to be in need of a tavern. A trip ten miles beyond Boston required spending the night. And the arrival of the stage coach at one of these taverns was the event of many towns, making for a lively time in the evening of the arrival. Eager villagers, hoping for information from distant towns, would drop in one by one, mingle with the day's arrivals around the fire in the great room, and listen with attentive ears to the news that they related. Around the fire the assembled company would discuss all manner of topics, though politics seemed to be the main subject. There were newspapers, bulletins, and broadsides brought in and available for the more solitary to receive news and information, or to back his claim during a discussion. 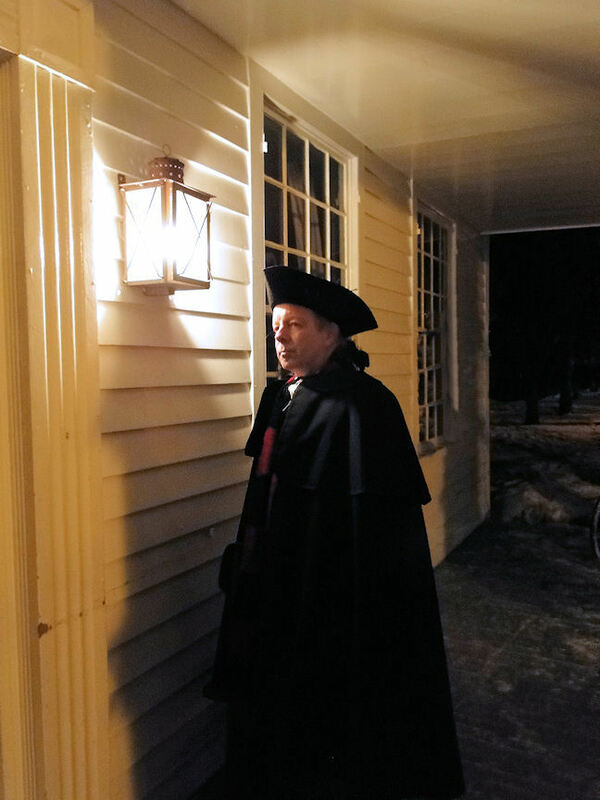 "I have heard Dr. Franklin relate with great pleasantry that in travelling when he was young, the first step he took for his tranquility and to obtain immediate attention at the inns was to anticipate inquiry by saying, 'My name is Benjamin Franklin. I was born in Boston. I am a printer by profession, am travelling to Philadelphia, shall have to return at such a time, and have no news. Now, what can you give me for dinner?'" In 1762 another Benjamin - Benjamin Mifflin - was not as kind to a curious patron, who may have been attempting small talk, but it certainly wasn't welcome. Mr. Mifflin reacted violently to the questions he was asked: "(I) had hardly got in the House before an Impudent Planter demanded my name, but not chusing to satisfie his Impertinence he laid hold on me to take me up. (If it were not for the Landlord stepping in), he would have had the But End of my whip which I had lifted up to give him." Inside an ordinary (sketch by Edwin Tunis): as one man wrote in 1732: "To avoid conversation is to Act against the Intention of nature. To live then as men we must confer with men. Conversations must be one of the greatest pleasures of life." Toddy (hot toddy), flip, and other drinks were generously passed around until, tired and worn out from the long trip and long talks, the new arrivals gradually retired to their rooms. Flip, by the way, was a blend of beer, rum, molasses (or dried pumpkin), and eggs or cream, and was usually mixed in a pitcher and then whipped into a froth by plunging a hot fire poker (called a flip-dog) into its midst. The tavern keeper would then decant the singed creation into ceramic mugs or featherlight flip glasses. Food at a rural colonial tavern was generally fair, and travelers expected no more than mediocrity upon dining while on the road, with the choices limited and the prices fluctuating. Simply prepared over an open hearth, the types of food for dinner was what was commonly found in the cupboard of an 18th century community, which many times meant whatever the owner had on hand for his own family and was willing to share. At times the servings could be fairly well and include bread and cheese, pigeon fricassee, roast fowl, pasties, and pie, all washed down with a tankard or mug of cider. Other times, however, the servings could be rather awful. Sarah Knight wrote in her diary about her travels by horseback from Boston to New Haven, and her dining experience at the local tavern: "We would have eat a morsell, but the Pumpkin and Indian-mixt Bread had such an aspect, and the bare-Legg'd Punch so awkwerd or rather awfull that we left both." At another tavern Mrs. Knight mentions dining on "mutton-flavored with the odor of head sauce, a mangled chicken fricassee, and some Pumpkin and Indian mixt Bred which had such an Aspect." It certainly doesn't sound like poor Sarah had much success during her 1704 travels. Breakfast was described in this manner by a different journeyer: "(I) was call into breakfast --- a large Square pine table some Bohea tea on it. Sugar Near the Colour of Molasses, the water Boiled in a porridge pot & Lader abit, pewter Spoons the Colour of led some fried Bacon & Eggs & Broiled Mutton." On the other hand, Samuel Vaughan wrote in his 1787 traveling diary about his fine dining experiences: "ham, bacon & fowl pigeon of one sort or another always to be had upon the road & often fresh meat or fish, dried venison Indian or Wheaton bread, butter eggs milk, often cheese, drinks Rum Brandy or Whiskey, resembling Gin." "It is the custom of all American taverns, from the highest to the lowest, to have a sort of public table at which the inmates of the house and travellers dine together at a certain hour. It is also frequented by many single gentlemen belonging to the town. Upwards of thirty sat down to dinner, though there were not more than a dozen who resided in the house." The table is ready for a meal and hungry patrons. and the proprietor ensured that any customer that favored him "may depend on the best treatment (and) the very best of Provisions, Liquors &c."
One who may have been satisfied with bread, cheese, and cold apple pie for a meal while traveling along the vast rural roads would have expected something much more substantial in the cities, such as veal, beefsteak, green peas, and raspberries. The same Englishman from the previous paragraph also wrote, "At the better sort of American taverns very excellent dinners are provided, consisting of almost everything in season. The hour is from two to three o'clock, and there are three meals in the day. They breakfast at eight o'clock upon rump steaks, fish, eggs, and a variety of cakes with tea or coffee. The last meal is at seven in the evening, and consists of as substantial fare as the breakfast, with the addition of cold fowl, ham, &c. The price of boarding at these houses is from a dollar and a half to two dollars per day. Brandy, hollands, and other spirits are allowed at dinner, but every other liquor is paid for extra." Like the rest of 18th century society, the taverns were male-dominated and, although women ran and worked in taverns, they were seldom patrons. Ladies just did not travel alone very often, and were usually under the protection of fathers, brothers, husbands, or male escorts. It was not unusual to see a "barefooted girl of fifteen down upon her knees engaged in scrubbing the floor, dressed in the coarsest of ill-fitting apparel." A lone female traveler was especially a rarity, though not unheard of. In 1778, Katherine Farham wrote about traveling alone: "I was in great distress, but what could I do in a Publick House, no person to take care of me?" The aforementioned Sarah Knight showed up at a tavern alone late one evening during her horseback journey in 1704 and, as she wrote in her diary, was "interrogated" by the daughter of the keeper "with these or words to this purpose: "What in the world brings You here at this time of night? I never see a Woman on the Rode so Dreadfull late in all the days of my versall life. Who are you? Where are you goeing? I'm scar'd out of my witts..." She then turned agen to mee and fell anew into her silly questions without asking mee to sit down. I told her she treated me very Rudely and I did not think it my duty to answer her unmannerly questions. I pray'd her to show me where I must lodge. Shee conducted mee to a parlour, which was almost filled with the bedstead, which was so high that I was forced to climb on a chair to gitt up to ye wretched bed that lay on it, on which having Strecht my tired Limbs and lay'd my Head on a Sad-coloured pillow..."
Sarah Knight was quite an unusual woman for her time: in 1704 she traveled alone, on horseback, from Boston to New Haven, to settle affairs for her cousin on behalf of his widow - an unparalleled feat for a woman at this time. She kept a diary of her travel tales, which lay tucked away until the early part of the 19th century when it was found and published into a book (see link at the bottom of this post). Sleeping accommodations in taverns varied, and it was common to have beds in nearly every public room. Generally, the number of beds listed in both rural and urban 18th century taverns is low, according to inventories. Traveler's descriptions include accounts of "making do" with the crowded quarters, makeshifts beds, lack of linen, very low bed count, and dirt. Getting a night's rest was not the private ordeal we are accustomed to in our modern times. Benjamin Bullivant wrote of a sleepless night at an ordinary when he was "disturbed by some privateers who brought theyr girles thither to make merry and were so til 2 in the morning in the same Room where I was in bed." In the more rural smaller taverns, the traveler many times found themselves sharing a room and a bed with the tavern-keeper's family. It was a usual practice for paying customers to share room and beds with other travelers, and this practice went on into the later part of the 19th century. In the wintertime, however, sleeping two or more to a bed was practical for the purpose of generating heat. Without central heating, the area around the fireplace was the only truly warm spot, so multiple sleeping partners was a popular way of gaining warmth, and with most floors bare, the winter cold made them biting to even the stocking-clad foot. 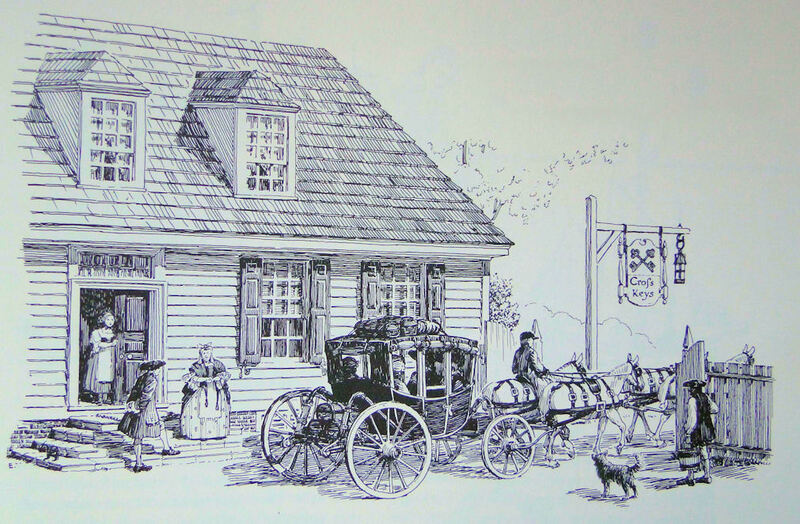 The Raleigh Tavern, again in Williamsburg (across the way from Mr. Shields), was also an exception: in 1771, 38 beds were recorded there, and even bed-curtains were used. Regular bathing was not a common practice, and sheets were not laundered frequently. Richard Bissett, visiting America from England, noted that he was, after examination, given the cleanest bed out of the five available, but still wrapped himself in his great coat before climbing in, for he did not pretend the bed had not been slept in frequently before. As we have see, these publick houses were not always well received by travelers, and some sought other means of lodgings. As Lutheran pastor John Boltzius wrote in 1742, "We did not wish to lodge with our people at a public tavern because of the cost and disquiet." for the comfort of the townspeople. Activities in the middling "and better" city establishments were centered around economic life and included everyday business transactions, mercantile exchange, and events such as auctions of goods and property. City officials frequently held their meetings in taverns until they had their own headquarters built. Gatherings were held and patrons exchanged opinions. 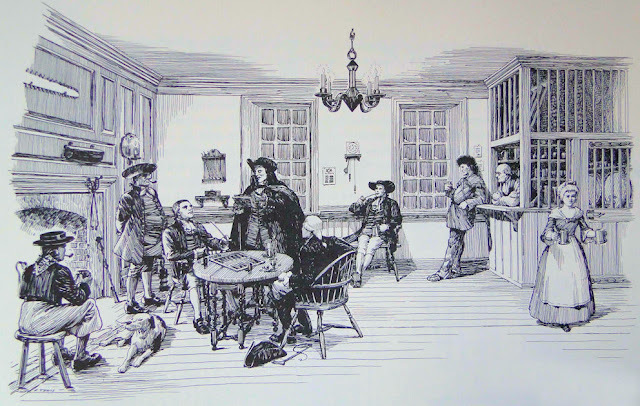 As in the rural taverns, current events were debated - men gathered to talk over the terrors of Indian warfare at the time of the French and Indian War, for instance, and a few years henceforth turned to a discussion of the acts of Parliament in distant England, leading through the anxious but unwavering years preceding and during the Revolution. And these conversations sometimes went into the wee hours, as Alexander Hamilton observed: "I returned to my lodging at eight o'clock, and the post being deliver'd, I found a numerous company at Slater's reading the news. Their chit-chat and noise kept me awake 3 hours after I went to bed." The fourteenth of August, 1769, was a merry day in Boston and vicinity. 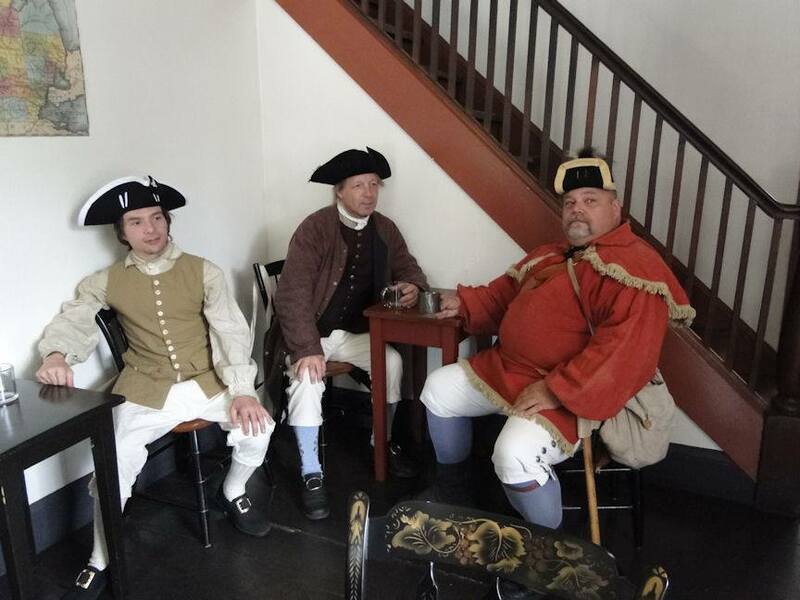 The Sons of Liberty, after assembling at the Liberty Tree, all adjourned for dinner at Robinson's Tavern in Dorchester. Tables were spread in an adjoining field under a tent, and over three hundred people sat down to an abundant feast, which included three barbecued pigs. Speeches and songs inspired and livened the diners. Although forty five toasts were given, John Adams, eventual 2nd President of the United States, says in his diary that "to the honor of the Sons I did not see one person intoxicated or near it." In Shrewsbury, Mass., was an old ordinary known as Farrar's Tavern, run by Major John Farrar, an army officer of "considerable distinction." For travellers passing through, Farrar's was a popular resort, and it is very likely it was at this tavern that John Adams overheard one night in 1774 during his stay a conversation which so impressed him that he set it down with scarcely concealed pleasure, and in doing so leaving us a good contemporaneous picture of the first notes of dissatisfaction such as were heard in every tavern, in every town, in the years which were leading up to the Revolution. "Within the course of that year, before the meeting of Congress in 1774, on a journey to some of our circuit courts in Massachusetts, I stopped one night at a tavern in Shrewsbury about forty miles from Boston, and so I was cold and wet, I sat down at a good fire in the bar-room to dry my great-coat and saddle-bags, till a fire could be made in my chamber. There presently came in, one after another, half a dozen, or half a score substantial yeomen of the neighborhood, who, sitting down to the fire after lighting their pipes, began a lively conversation on politics. As I believed I was unknown to all of them, I sat in total silence to hear them. 'Well,' said a fourth, 'if Parliament can take away Mr. Hancock's wharf and Mr. Rowe's wharf, they can take away your barn and my house.' After much more reasoning in this style, a fifth, who had as yet been silent, broke out, 'Well, it's high time for us to rebel; we must rebel some time or other, and we had better rebel now than at any time to come. If we put it off for ten or twenty years, and let them go on as they have begun, they will get a strong party among us, and plague us a great deal more than they can now.' "
Then there's the Green Dragon Tavern, which is one of the most famous of historic taverns. In fact, it was so well known for its political activities that Daniel Webster called it "the headquarters of the American Revolution." The basement of the Green Dragon Tavern was used by several secret groups, and it's been said that the Boston Tea Party was planned there, and Paul Revere may possibly have been sent from the Green Dragon to Lexington on his famous ride. "In the fall of 1774 and winter of 1775, I was one of upwards of thirty men, chiefly mechanics, who formed ourselves with a Committee for the purpose of watching the movements of the British soldiers and gaining every intelligence of the movements of the Tories. We held our meetings at the Green Dragon Tavern. This committee were astonished to find all their secrets known to General Gage, although every time they met every member swore not to reveal their transactions even to Hancock, Adams, Otis, Warren, or Church." They found out after it was Dr. Church who wound up being the traitor. The Green Dragon was a large brick building on Union Street and was the center of Revolutionary War activity. The horse and carriage you see is a one-horse chaise such as Paul Revere himself used on at least one of his Revolutionary rides. 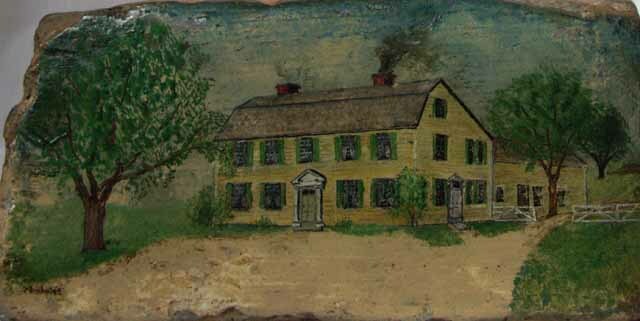 On April 18, 1775, one day before the outbreak of the battle of Lexington and Concord, Munroe Tavern was one of the meeting spots for colonials, owned by William Munroe, orderly sergeant of Captain John Parker’s militia company, and proprietor of the tavern until 1827. 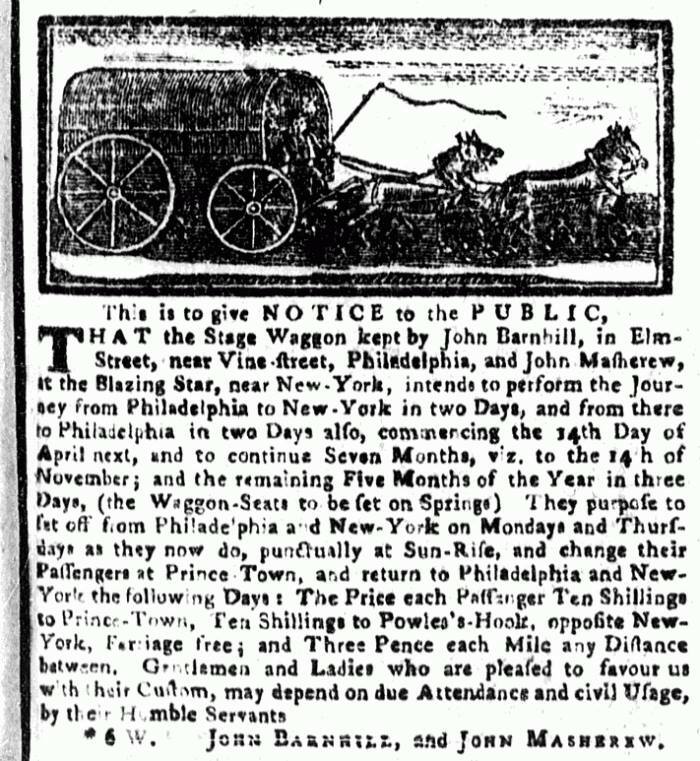 At 6:30 p.m. that evening, Solomon Brown of Lexington, who had gone to the market in Boston, returned and reported to Munroe that he had passed a patrol of British soldiers. The Buckman Tavern of Lexington, Mass., was also one of the rallying places of the Minute Men on the evening of April 18, 1775. Several dozen militiamen gathered on the town common, and then eventually went to Buckman's to await the arrival of the Regular Army. Definite word reached them just before sunrise and Captain Parker's company of militia left the tavern to assemble on the common. Many people do not know that in the wee morning hours of April 19, Paul Revere was captured by the British Regulars and threatened with having his "brains blown out" if he didn't tell them the truth about what he knew of the Patriot's plans. Only a couple hours later, upon hearing gunfire coming from the direction of Lexington, the Regulars, in order to move much more quickly to warn their commanders of the coming events from the information they had extracted from Revere and other riders, set their captives free, though taking their horses. Elijah Sanderson, one of the prisoners with Revere whose testimony has given us a more complete picture of the events of that night, walked straight for the welcoming lights of Buckman's Tavern. Sanderson wrote, "I went to the tavern. The citizens were coming and going; some went down to find whether the (Regulars) were coming; some came back, and said there was no truth in it. I went into the tavern, and, after a while, went to sleep in my chair by the fire." A large force of British troops arrived at Lexington before dawn the next morning, and shots were exchanged on the town common, beginning the Battles of Lexington and Concord. That afternoon the Munroe Tavern served as the headquarters for British Col. Hugh, and his one thousand reinforcements. 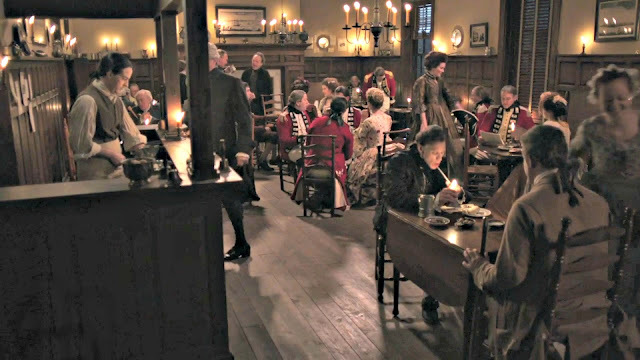 The Regulars occupied the tavern for one and one-half hours, during which time the dining room was converted into a field hospital for the wounded, while exhausted British soldiers consumed liberal quantities of food and drink. The troops also shot down John Raymond, an infirm man residing in the family. In later years - 1789 to be precise - President George Washington dined at the Munroe Tavern when he visited the Lexington battlefield. 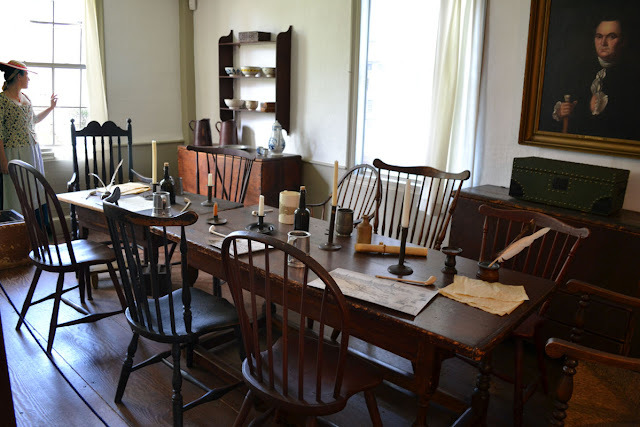 An upstairs room now contains the table at which he sat and documents relating to his trip. Both the Buckman and the Munroe Taverns still stand today, restored to look as they did at the time of the first shot of the Revolutionary War occurred. 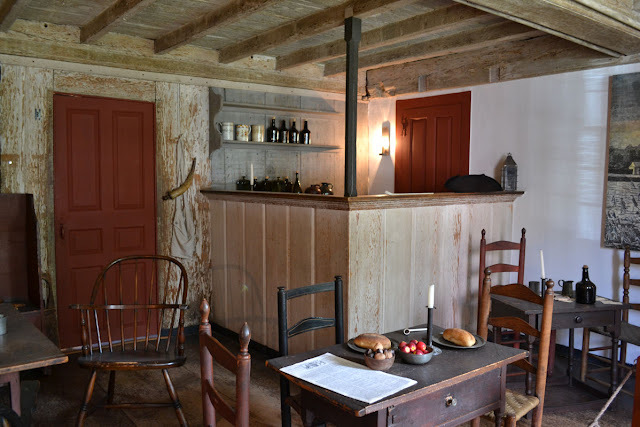 The "bar" portion of the beautifully restored Buckman's Tavern. 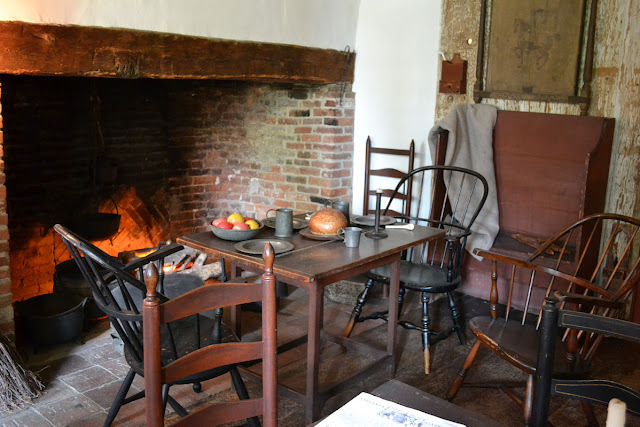 Can you just imagine the men of Lexington, very early in the morning of April 19, 1775, sitting around this bar or near the fireplace in the photo above this one, discussing what may happen? 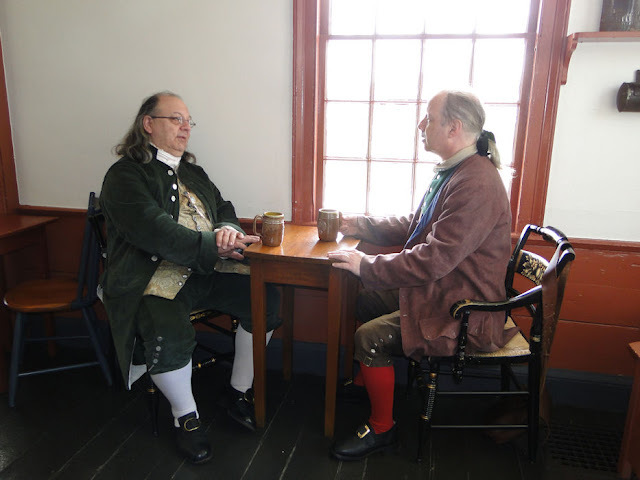 There are stories that take place at one of the more famous taverns during the Revolutionary War - the City Tavern in Philadelphia - where we hear that in 1777, the nation's first 4th of July celebration was held "with festivity and ceremony becoming the occasion," according to John Adams. 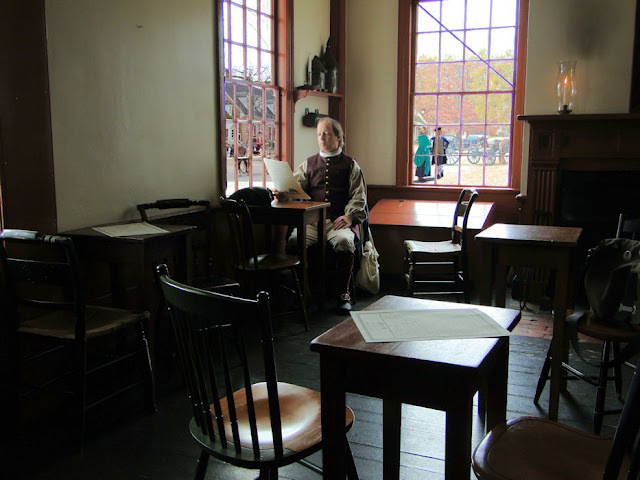 When George Washington moved his headquarters to Philadelphia later that summer, his letters indicate that he used the City Tavern as his informal headquarters. When the British retook Philadelphia that fall, the innkeeper Daniel Smith welcomed them with open arms. The Tavern became the center for officer recreation, including a series of balls where the local Tory belles were entertained. 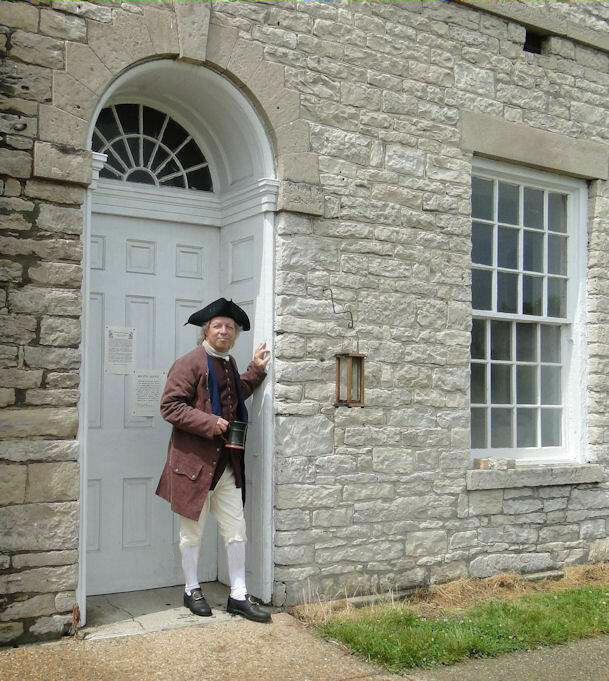 Innkeeper Smith returned to England in 1778 after Philadelphia was reoccupied by the Continental army. Under American rule, this tavern, once again, was the center for balls and other special events for the well-to-do, especially now that Philadelphia was inundated by politicians needing entertainment, room, and board. And to really give this building the red, white, and blue thumbs up: on September 17, 1787, thirty nine delegates representing twelve of the thirteen states adjourned, according to record, "to the City Tavern, dined together, and took a cordial leave of each other" after approving a Constitution for the United States of America. In the following decades, the City Tavern gradually declined, then caught fire, which damaged it beyond repair. In 1854 when it was demolished, the Pennsylvania Gazette wrote: "Nobody is going to miss this Tavern except those persons living in the past." A hundred years later, in 1954, extensive research utilizing documentation of the original structure directed reconstruction of the City Tavern on its original location, thus recreating this historic building, brick by brick, finally being completed it in time for the Bicentennial celebrations of 1976. 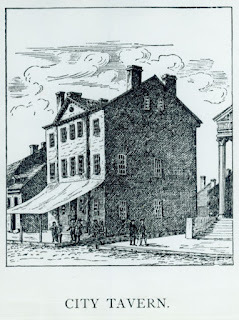 In New York City, the Fraunces Tavern held many patriotic meetings, and, on December 4, 1783, one of the most famous of these was held; it was at this tavern, in what was known as the Long Room, where General Washington sadly bade farewell to his fellow officers who had fought with him in the War for Independence. He said to them, "With a heart full of love and gratitude, I now take leave of you. I most devoutly wish that your latter days may be as prosperous and happy as your former ones have been glorious and honorable." Washington then asked to take each by the hand for a personal word of farewell. As you can see, taverns, publick houses, ordinaries - whatever you prefer to call them - played a role of utmost importance in the history of our Nation, and I am so thankful for the previous authors and historians who had researched this subject in order for us in future times to have a greater understanding and appreciation of the times in which this country was formed. Unfortunately, in my neck of the colonial woods (Detroit area of Michigan), all remnants of the colonial tavern are long gone; Detroit, founded 75 years before the signing of the Declaration of Independence, had a devastating fire in 1805 which burned the entire city to the ground. However, we still have early and mid-19th century taverns dotting our state - most having been restored to their former glory, and these beautiful old buildings are not too far off in design from their predecessors, especially in the interior. 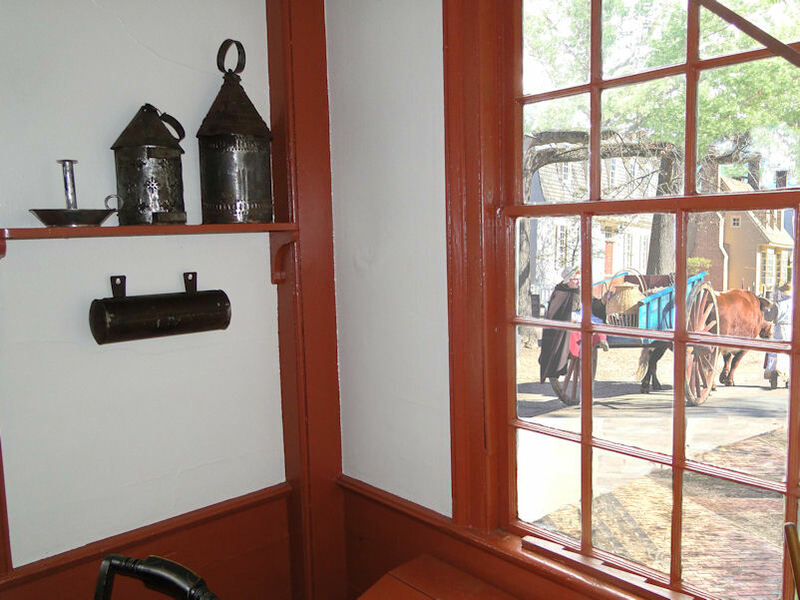 Some of the photographs herein were taken at the 1831 Eagle Tavern, saved from certain destruction and handsomely restored to its former glory inside Greenfield Village, and serves well in appearance as one from the colonial era, as you can also see by the video clips within this post. Mr. Fred Blystone, who resides near and often frequents Colonial Williamsburg, and Ms. Vicki Stevens, who lives close enough to Boston and surrounding historic areas to visit nearly anytime she'd like. Both have been very kind in supplying most of the photos you see (credit is also given beneath each of their respective pictures), and both are extraordinary photographers. The pictures without credit? Why, they came from my camera, either taken by me, or, if I am in the photo, most likely taken by my daughter. 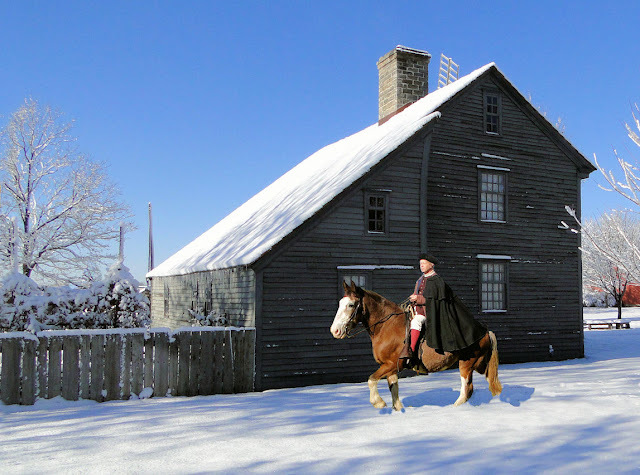 A Colonial Christmas - Just how did they celebrate Christmas in the 18th century? And, of course, with many of the photos in this post taken at Colonial Williamsburg, I would think they would entice the reader to want to explore the opportunity to visit such a wonderful historical site: click HERE to check it out. Upper Michigan has authentic colonial history at Mackinaw City and Mackinac Island. More locally, Greenfield Village has three authentic colonial-era homes brought here from the east coast (Daggett, Plympton, and Giddings), and one English cottage (Cotswold), built around 1620, brought over from England. Ken you post the best stuff!!!!!! Thank you and BEAUTIFUL photos!! Thank you so much! That means a lot coming from one of my favorite bloggers! This was so informative, Ken. Thank you for sharing! I appreciate hearing from you Erin - - thank you! Great read! If you are ever in Fredericksburg, VA, I encourage you to visit the Rising Sun Tavern. I most definitely will Cincinnatus! I really adored this particular blog, Ken Giorlando! I had just mentioned a woman named Mary Peale Field in an earlier post here. She ran a tavern such as you have described in your article. Reading this just made it very real for me. Another thing--I am a true devotee of DETAIL! I crave details when devouring history, and you do not leave me unsatisfied! Terrific piece, and bravo, my friend! Wonderful information as usual. I really wasn't sure how my female protagonist in my current WIP would get from Rhode Island to Boston, but now I have a better idea of the awful journey it was back then. Thank you from the bottom of my heart.